I wrote about this Norwegian dish on my Tumblr a few years ago. Making it last night reminded me how incredibly simple but delicious it is, so I thought I’d republish it here. The translation of fårikål is “lamb (or mutton) in cabbage” which, to be honest, probably isn’t making you want to try it. However, I urge you to as it’s a very plain dish on the face of it but easy to make and very delicious, wholesome and warming: the ultimate comfort food. It’s traditional to eat it in the autumn in Norway, but there’s no reason at all not to make it in February or any other (winter) month. I was interested and delighted to read that the recipe Magnus Nilsson gives for this dish in his wonderful The Nordic Cook Book is more or less the same as the one that’s been handed down to me by Norwegian grandmother via my mother. Take some chunky pieces of lamb on the bone. My mother used to use chump chops, but I’m not sure if this term is used these days. Take a large white cabbage (or a green one, but my mother always used white so that is what I do too), or a small one if you’re only cooking for a couple of people. Cut it into fairly large wedges. In a casserole or large saucepan layer the cabbage and the lamb, sprinkle in some salt and fill it half way up with water. You now need to add black peppercorns and it’s very handy if you have one of these spice infusers (see photo). When I was growing up my mother would bring these back from Norway for all her friends. I’ve never seen them in the shops here but my husband spotted this “Spice Infuser GUSTO” from Gefu online which I’m sure will do the same job. You fill it with whole black peppercorns and place it in among your lamb and cabbage. Then you simply remove it at the end of cooking and diners don’t have to bite into peppercorns, which can a) give them a fright or b) break their teeth. It’s also not very pleasant. Of course if you haven’t got one you can tie the peppercorns (about a tablespoonful) in a muslin bag or indeed live dangerously and leave them loose in your stew. Bring the whole thing to the boil on the boiling plate and then place it, covered, in the simmering oven for a minimum of two hours but preferably longer until the lamb and cabbage are tender. Some like to thicken their fårikål by dusting the raw lamb pieces with flour, but I have never done this and don’t think it’s necessary. Serve with plain boiled potatoes and plenty (and I mean a lot) of chopped parsley. 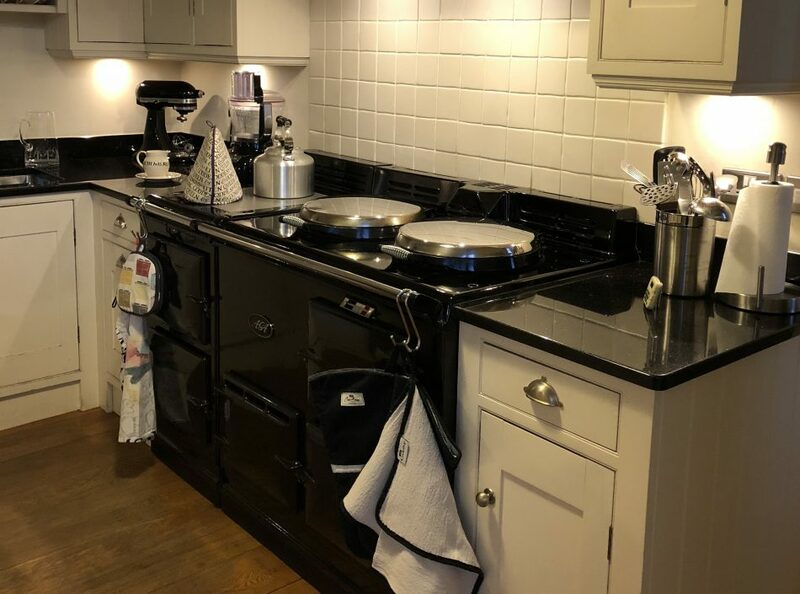 Before she became a TV celebrity Mary Berry was known as an Aga cook who ran courses on how to get the most out of your Aga as well as for writing The Aga Book which I believe is still given to every new Aga owner when their new oven is installed. My mother-in-law, who has owned a few Agas in her time, learned how to make this stew on one of Mary Berry’s courses and wrote it out for me many years ago because she thought it was so simple yet so delicious. I never got round to making it then but when I found a jar of sun-dried tomatoes which needed using up in my fridge recently, the recipe sprang to mind and I dug it out. You can make this the day before, refrigerate it overnight and reheat it gently in the simmering oven the next day. I have never worked out why but casseroles are often better when made a day ahead. The quantities of wine and stock given here are approximate because, as we Aga cooks know, you tend to need less liquid in an Aga. I start with the wine and stop pouring when the meat is almost but not completely covered. You can always add stock later on if you think it needs it. This is delicious with mashed potato but I think I prefer it with rice. Serve with a green vegetable too.